For the past three years, Burlington High School’s Spanish Club has been spearheading a Food Drive during the month of December for Lawrence’s YWCA Fina House. This year, Spanish Club members packed over sixteen boxes full of pasta, soup, baking items, spices, canned vegetables and beans, cereal, apples and oranges, juice, and rice. This year’s Food Drive was a tremendous success thanks to Mrs. Dacey’s and Ms. DeSousa’s Spanish classes and Spanish Club members. 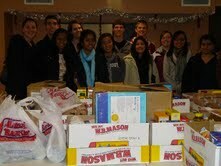 On December 14th, the students welcomed the opportunity to deliver the food items to the YWCA Fina House. Upon arrival, they were cheerfully greeted by program director, Susan, and Fina House employee, Jeanette. After learning about Fina House’s programs for young mothers and their children and struggling community members, students were invited to tour the living quarters of the apartment complex. 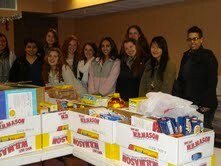 Burlington High School is proud of the successful Food Drive coordinated by the Spanish Club students. In their efforts to promote community service to those in need, the Spanish Club receives an A+! í Que trabajo lindo y precioso!! Muchísimas gracias para su ayudo a Ustedes.